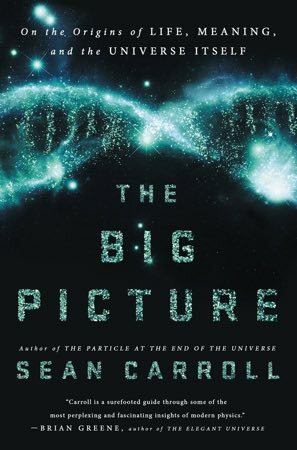 The Curious Wavefunction: Reality is a many-splendored thing: A review of Sean Carroll's "The Big Picture"
Reality is a many-splendored thing: A review of Sean Carroll's "The Big Picture"
Sean Carroll is a successful theoretical physicist, skilled ponderer of philosophical questions and gifted communicator of science. He brings all these skills to bear in his big-hearted, ambitious latest book “The Big Picture.” The book is part sweeping survey of some of the most thought-provoking ideas in modern science, part sweeping rumination on one of the most fundamental questions that we can ask: How do we gain knowledge of the world? The book can roughly be divided into two parts. The first part can be titled “How do we know” and the second can be titled “What do we know”. The siren song weaving its way through Carroll’s narrative is called poetic naturalism. Poetic naturalism simply means that there are many ways to talk about reality, and all of them are valid as long as they are rooted in naturalism and consistent with one another. This is the central message of the book: we make up explanations about the world and we call these explanations “stories” or “models” or “ideas”, and all of them are valid in their own ways. The first part of the book explores some of the central concepts in the philosophy of science that make up poetic naturalism. Carroll starts from Aristotle and the ancient Greeks and progresses through the Arabs. He explores the investigations of Galileo in the seventeenth century. It was Galileo and his intellectual successor Isaac Newton who showed that the world operates according to self-sufficient physical laws that don’t necessarily require external causes. One of the most important concepts explored in the book is Bayesian thinking, in which one assigns probabilities to phenomena based on one’s previous understanding of the world and then updates this understanding (or “priors”) according to new evidence. Bayesian thinking is a powerful tool for distinguishing valid science from invalid science, and for distinguishing science from nonsense: one could in fact argue that all human belief systems operate (or should operate) according to Bayesian criteria. Bayesianism does introduce an element of subjectivity in the scientific process, but as Carroll demonstrates, this supposed bias has not harmed our investigations of natural phenomena and has allowed us to come up with accurate explanations. Another thread weaving its way through the book is that of emergence and domains of applicability. Emergence means the existence of properties that are not strictly reducible to their constituent parts. Although Carroll is a physicist and holds fundamental physics in high regard, he appreciates that chemistry has its own language and neuroscience has its own language, and these languages are as fundamental to their disciplines as photons and electrons are to physics. No field of inquiry is thus truly fundamental in an all-encompassing sense, since there are always emergent phenomena that offer stories and explanations in their own right. Emergence also manifests itself in the form of what are called effective theories in physics; these are theories in which the macroscopic behavior of a system does not depend in a unique way on a detailed microscopic description: for instance a container of air can be perfectly described by properties like its average temperature and pressure without resorting to descriptions of quarks and Higgs bosons. As long as the two domains are consistent with each other (what Carroll calls “planets of belief”) we are on firm ground. These ideas lay the foundation for the second half of the book which takes us on a sweeping sojourn through many of the key ideas of modern science. Carroll says that the most important description of the world comes from what’s called the ‘Core Theory’. This theory ties together the fundamental forces of nature and particles like the Higgs boson; it is grounded in general relativity and quantum mechanics. It can explain the entire physical universe, from atoms to the Big Bang, certainly in principle but often in practice. Later chapters deal with topics like evolution in real time, leading theories for the origins of life, thermodynamics and networks in the brain. When Carroll talks about entropy, complexity and the arrow of time he’s in his element; one important aspect of complexity which I had not quite appreciated is that complexity can actually result from an increase, not decrease, of entropy and disorder if guided the right way. The book also dwells in detail upon Rene Descartes since his ideas of dualism and pure thought seem to pose challenge to poetic naturalism, but as Carroll demonstrates, these challenges are illusory since both the mind and the body can be shown to operate based on well known physical principles. These ideas keep appearing in the later parts of the book in which Carroll deals with many thought experiments in philosophy and neuroscience that purport to ask questions about reality and consciousness. Some experiments involve zombies, others involve aliens simulating us; all are entertaining. A big question is subjective experience (or “qualia”) which is sometimes regarded as some kind of impenetrable domain that’s divorced from objective laws of nature. For the most part Carroll convincingly shows us that the same laws of nature that give rise to the motion of the planets also give rise to one’s perception of the color red, for instance. This section of the book involving famous conundrums like John Searle’s Chinese Room and ‘Mary the Color Scientist’ is fascinating and highly thought-provoking, and while the thought experiments have no clear resolution, Carroll’s point is that none of them violate the basic naturalistic structure of the universe and demand mysterious explanations. His discussion of consciousness is also very stimulating; he thinks that consciousness is not really a thing per se but an emergent property of organized matter. More succinctly, it’s a description of a particular way in which matter behaves rather than something that is beyond our current understanding of natural law; it is what we say rather than what is. Much of Carroll’s discussion here reminds me, as cheesy as it sounds, of a line from ‘The Matrix’: words like love, care and purpose are mere descriptions borne of language - what matters are the connections they imply. The book ends by taking us on a tour of some of the most important philosophical questions that human beings have asked themselves; questions of meaning, purpose, emotion and free will. Personally I found this section a bit rambling but I cannot really blame Carroll for this: none of these questions have a definitive answer and all are subject to speculation. On the other hand, this little tour provides non-specialists with an introduction to well-known philosophers and philosophies, including constructivism, deontology and utilitarianism. The big question here is how meaning can arise from the impersonal natural laws that have been described so far. Neither Carroll nor anyone else knows the answer, and the book simply makes the case that all these qualities are emergent properties that are all consistent with poetic naturalism. You may or may not be satisfied by this answer, but it certainly provides food for thought. In a book as ambitious as this one there’s bound to be some disagreement, and that’s a good thing. Here are some concerns I had: Generally speaking Carroll is on more firm ground when talking about science rather than philosophy. Quite oddly at one point, he uses poetic naturalism to argue against opposition to gay marriage and LGBT rights. While his support for these issues is one I heartily share, I am not sure poetic naturalism is the best or the most persuasive reason to uphold these causes: we should support them not because of but in spite of naturalistic reasons. Also, Carroll who is an atheist spends several paragraphs describing how all of the arguments for a supernatural God violate naturalism. However I think religion has a purpose beyond describing the real world, and ironically this purpose lends itself to the same analysis that Carroll does of human qualities like care and love. I would think that based on much of the book’s narrative, religion would be described as an emergent phenomenon that provides people with a set of stories and descriptions; these stories provide succor and and a sense of community. Are these stories real? They may not be, and they are certainly not grounded in natural law, but Carroll himself says at one point that models of the world should be used because they are useful, not because they claim to be real. Shouldn’t one say the same thing about the positive and personal aspects of religion? Great review! I'll add this book to my reading list. I think "The Righteous Mind" (also written by someone who doesn't believe in the underlying truth of religion) makes the point that religion is socially useful - I think (if I'm not misstating) that Haidt is arguing that religion binds people socially and so helps societies to maintain their identities and propagate their ideas. Anything with that power is subject to misuse (or use for bad ends), but it may not be possible to fulfill the society-binding goals of a story without such power. Yes, correct. The Righteous Mind is a great book. The UNBELIEVABLE similarities between Sean Carroll’s idea (2016) (California Institute of Technology, USA) (within the wrong framework, the “universe”) and my ideas (2002-2010) (within the EDWs framework) on quantum mechanics, the relationship between Einstein relativity and quantum mechanics, life, the mind-brain problem, etc.